Saudi Arabia uses British arms to kill civilians in Yemen – support the embargo! The article below by Stephen Bell, about Britain’s involvement and support of Saudi Arabian military intervention in Yemen, was originally published by the Stop the War Coalition. On February 25th, the European Parliament approved an EU wide arms embargo against Saudi Arabia until alleged breaches of international humanitarian law in Yemen have been fully investigated. The vote was convincing, with 449 MEPs voting in favour, 36 against, and 78 abstaining. The resolution itself follows a citizens’ petition signed by 750,000 people. Richard Howitt, Labour MEP, and Alyn Smith SNP, played an important role in tabling the issue. The vote is not legally binding upon member governments. But it is politically significant in that it opens up a new front in the campaign against the war upon Yemen. The Control Arms campaign estimates that in 2015, Saudi Arabia received arms sales and licences worth $25 billion. The US is the largest supplier. In the EU, the UK and France are the main suppliers, although Germany, Italy, the Netherlands and Sweden are also suppliers. According to the Campaign Against the Arms Trade, nearly £3 billion of arms sales were made by the UK to Saudi Arabia in 2015. Saudi Arabia is the main recipient of UK arms. This has resulted in it having twice as many British built fighters than the RAF, despite having less than half the population of the UK. The result of this huge trade was apparent in July 2015 when the UN declared a Level 3 Emergency in Yemen. That is the characterisation of the most severe, large scale humanitarian crisis. UN estimates in February 2016 are that 21.1 million people (80 per cent of the population) require some form of humanitarian protection or assistance – 14.4 million are “food insecure”, and 2.5 million are internally displaced. The same people providing arms on a grand scale are providing aid on a small scale. The Conservative government is boasting of having increased its humanitarian aid over 12 months to £80 million. That is approximately 2.7% of the value of arms sales to the Saudis. As Diane Abbott MP explained to the Tory Minister for International Development (DFID) “The work of DFID in Yemen is being undermined by UK arms sales”. The House of Commons International Development Committee has come out for suspending arms sales to Saudi Arabia. Some British politicians, at least, grasp the senselessness of providing aid to one side and ordinance to the other. An earlier UN Panel Report found that there was evidence of “widespread and systematic” air attacks upon civilian targets by the Saudi led coalition. 119 sorties were identified as appearing to be in violation of international humanitarian laws. Jeremy Corbyn called for an independent inquiry and an immediate embargo of arms sales to Saudi Arabia. Foreign Office Minister, Tobias Ellwood, responded that the Tory government would “take the report seriously”, but stated that thousands of sorties were being flown, and the Report was based on “hearsay and photographs”. Subsequently the Tories went further in covering things up. In the UN Human Rights Council, the UK government blocked an independent inquiry, and instead secured an inquiry to be made by the Saudi backed Hadi government in Yemen. Ellwood stated that the government is “… putting pressure on the Saudi government to investigate specific allegations”. The pressure appears to be composed of “private talks”. Tory hesitancy can be understood when it is registered that Saudi Arabia is the UK’s largest trading partner in the Middle East. The UK is also the second largest foreign investor there, after the US. In addition, the House of Windsor has the warmest relations with the House of Saud. So for some there are more important issues at stake than humanitarian laws, or the welfare of one of the most impoverished nations in the world. The other issue is how far British armed forces are involved in this catastrophe. British and US armed forces are working in the Saudi coalition command and control centre. In December 2015, Defence Minister, Michael Fallon, stated that 94 British personnel were embedded in Coalition HQ. So far, the Defence Ministry has refused to clarify their role. When questioned about UK/US knowledge of Saudi air strikes, Saudi Foreign Minister Adel al-Jubeir stated “They know what the target list is and they have a sense of what it is that we are doing and what we are not doing”. It is estimated by the UN that 60% of Yemeni civilian deaths and injuries are a result of “air launched explosive weapons”. Clearly, we need to know exactly what the British government involvement is with what Amnesty International has characterised as “… a pattern of appalling disregard for civilian lives”. For anti-war activists in Britain, the EU Parliamentary vote must be a call to action. We must be lobbying our MPs for an immediate embargo. 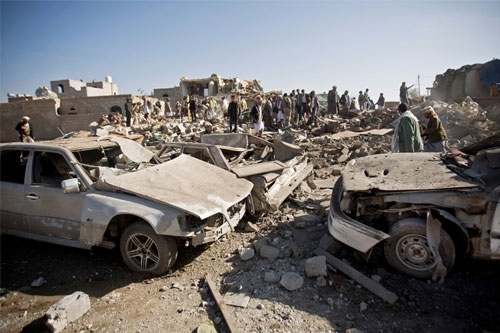 Activists must link up with the aid organisations; anti-arms trade campaigns; human rights organisations, and Yemeni organisations to put an end to the horrendous assault upon Yemen. This article was originally published here by the Stop the War Coalition.